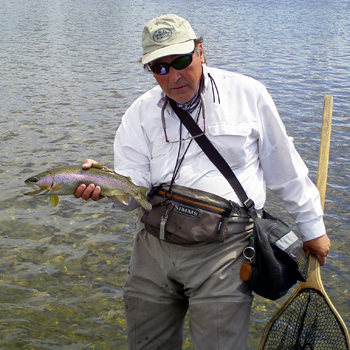 Michael Mastrangelo has been fishing the Bighorn River since 1985 and is the owner/outfitter for the Fort Smith Fly Shop and Cabins/Bighorn River Guides since 1997. Michael began fishing as a boy in Boston, Massachusetts with his uncle and cousins. They fished the ocean as well as lakes and streams around New England. Michael Mastrangelo is a professional guide on the Bighorn River in Montana, which is considered one of the finest rivers in the world for fly fishing. Listen it to hear Michael share his secrets about fly fishing this incredible fishery. He has been a fly tyer for many years. Some of his creations include the worminator, trout candy and the Indian headdress. Michael was the Past President of the Bighorn River Alliance for five years. A non-profit organization designed to preserve, protect and enhance the Bighorn River. In the off season, Michael spends time with other anglers at fishing shows and clubs presenting angling tips, tricks and techniques for fishing the Bighorn. He has spoken throughout the Rocky Mountain states as well as in New England. Michael has published an article on "Fishing the Bighorn” in the High Country Angler Magazine. He has taped several episodes for the TV show Columbia Country as well as many local television and newspaper articles relating to the Bighorn River. Since 2009 Bighorn River Guides has been offering a professional guide school with Michael and Chad Becker as instructors. This school is not only for people who want to become guides but for people who want to take a quantum leap in their fishing ability. In 2012 they started working with the Veterans Administration and are the only school in Montana eligible to accept GI Bill VA Education Benefits. Longtime clients call Michael the "troutfather."